This space used to be our only bathroom/ toilet. The toilet was separated from the bathroom by a wall which meant that the toilet was very narrow and the bathroom itself was too. There was literally only space for a single basin and a bath with a shower over it and then a very small little table in the one corner. 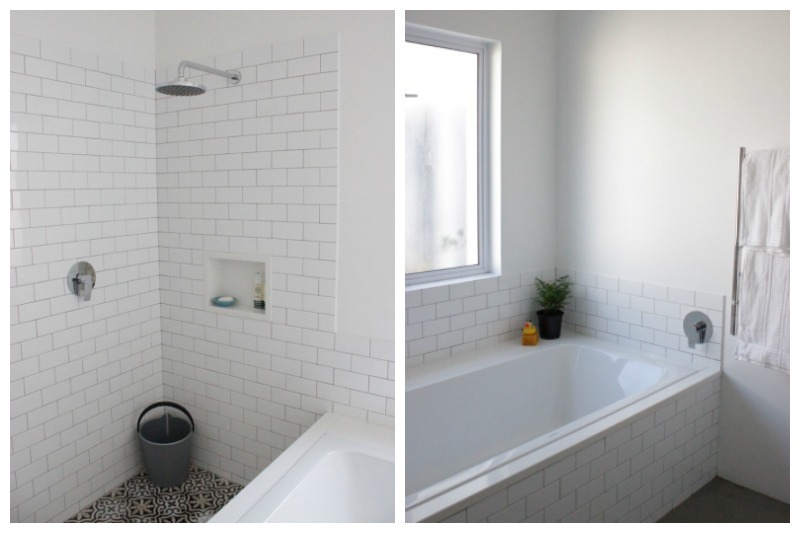 It really was my least favourite room in the entire house… probably because of the shower situation. 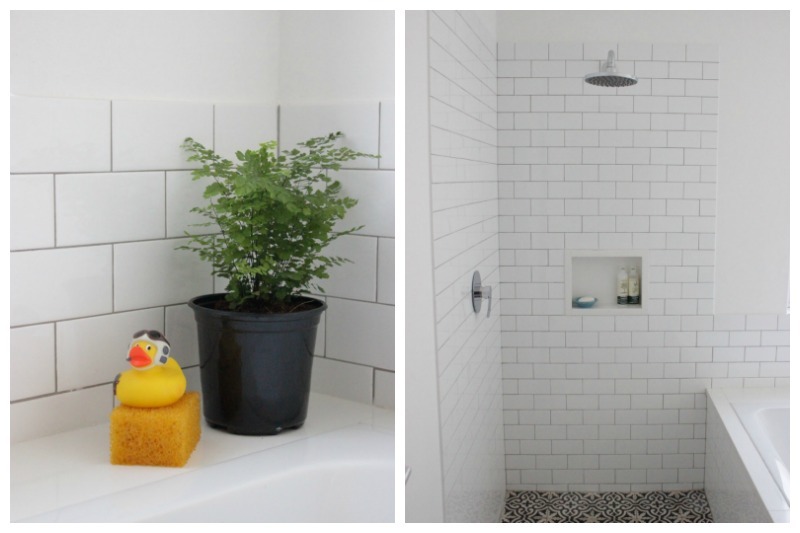 For almost 15 years I showered once a day standing in the bath trying not to let the shower curtain stick to my legs! When I wasn’t showering and keen for a bath, I had to avert my eyes from beneath the soap holder where a colony of black mold had set up home! It was soooo gross. For my updated family bathroom the idea was to break down the wall between the two rooms to make it one space. I was fortunate not to be stuck with a horrific coloured bathroom set, but the fittings we had were very 70s in their style so obviously I was very excited about updating them too. 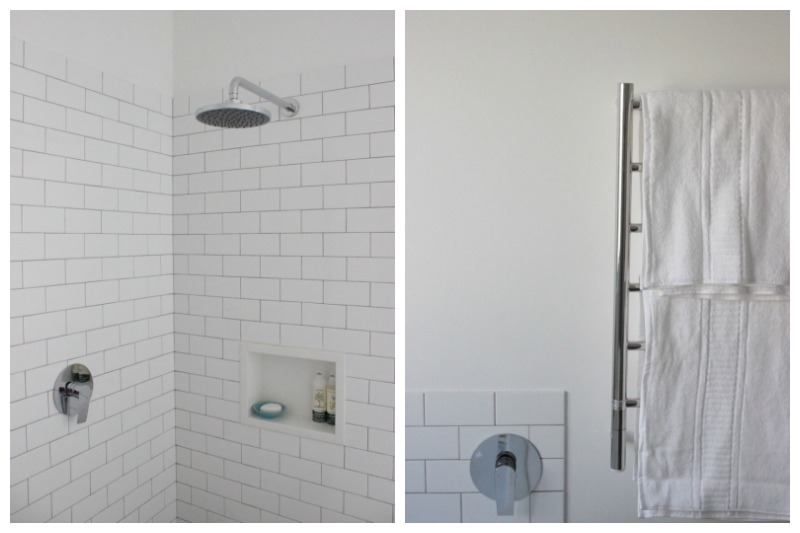 I opted for a classic white palette – white walls, white subway tiles, white fittings and a grey cement floor. This room is located on the South side of the house and I wanted to ensure it was kept as light as possible! 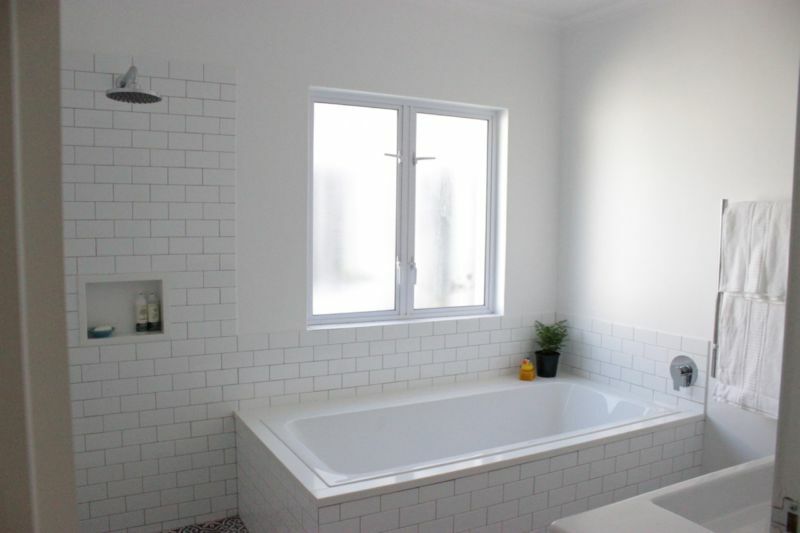 I also still wanted a reasonable sized family bath in the family bathroom, one that was comfortable for kids and adults, 2 at a time if need be! My kids no longer bath together but sometimes the need arises should you have family with younger kids staying over, or a special mommy-daughter “candle bath”. 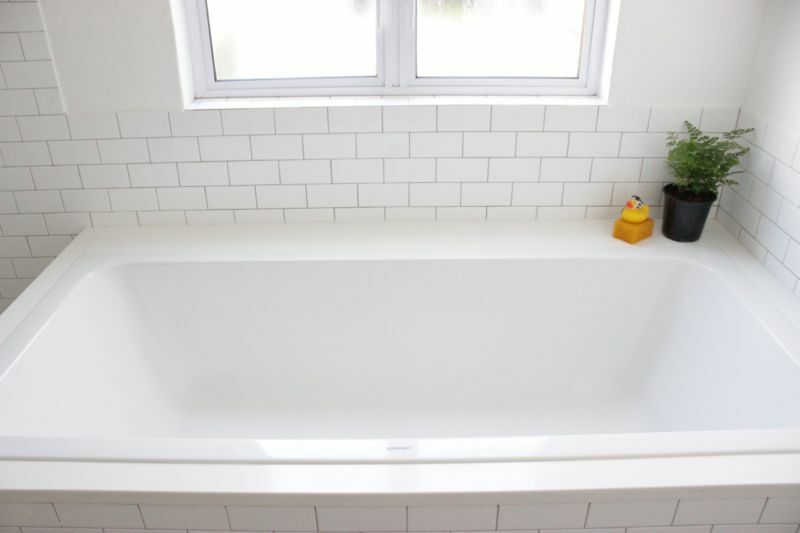 I wanted the bath to also be comfortable for kids to get in and out of and for moms bathing babies to have easy access so we set the bath a bit closer to the front rather than centered to the space. We settled on this lovely large bath from Duravit. The outlet and plug are both centered so that means it’s perfect for 2 and you can choose to rest your head in either direction if you’re bathing alone! The surround of the bath is made from engineered stone, and, although a bit pricey, really looks great! 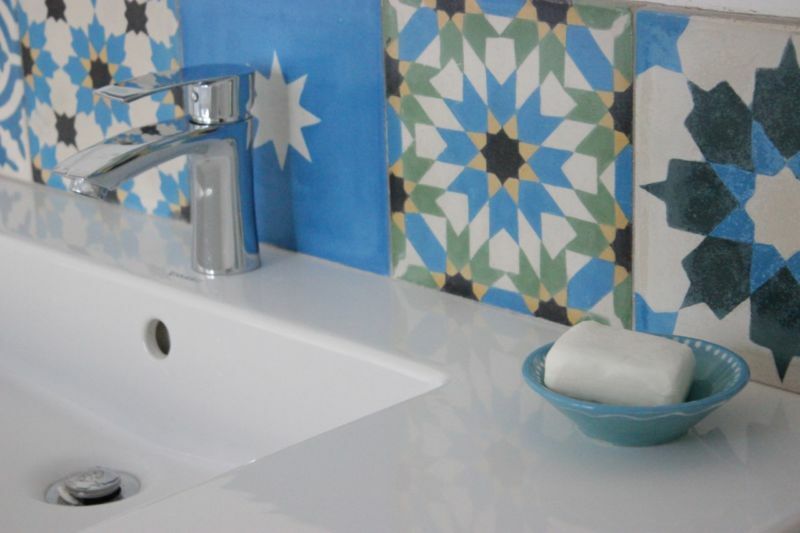 When I realised I would have a few blue, yellow and green patterned tiles left over from my kitchen splash back I quickly decided to use them as a little pop of colour in this otherwise monotone space! I think they really work well and I’m so pleased with this last minute idea!! Now I’m on the hunt for the perfect “Moroccan” style mirror to pop above them. I’ve seen one at Mr Price home but when I finally had the cash and went back to buy it, it had been sold. So sad!! Really hoping that they’ll get more stock soon! 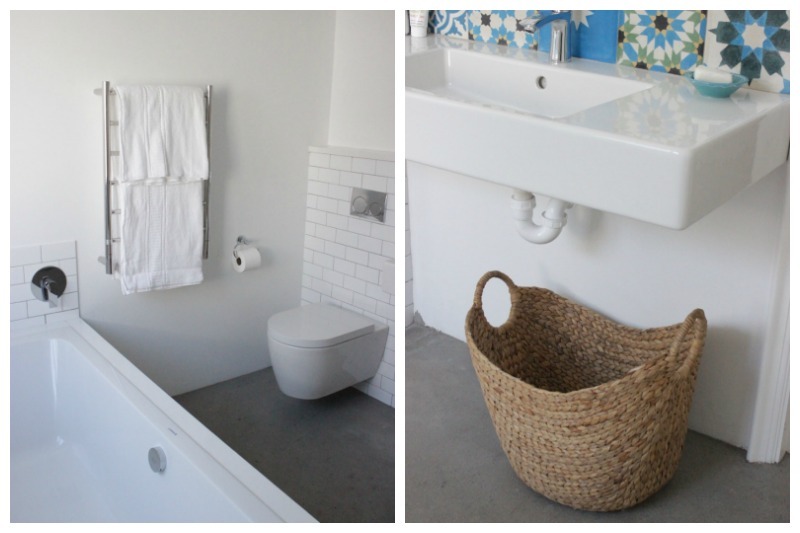 We tried to keep the lines for this space clean and my husband really loved the idea of floating toilets and basins. This toilet is from the Me by Stark range at Duravit and the basin is from the Vero range by Duravit, both available at CP&B and OnTap. 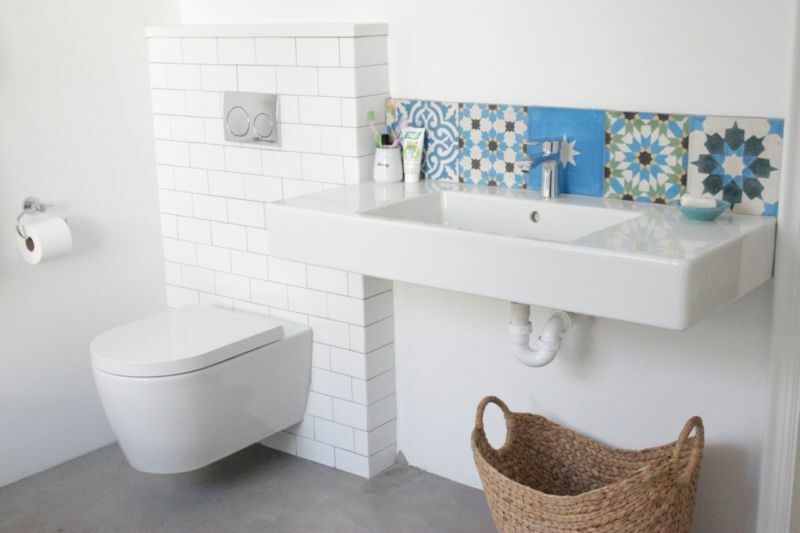 the toilet roll holder was also from Duravit and I found it on the sale table… always keep a look out for those one off deals when renovating!! The woven Water Hyacinth basket is from Makro. 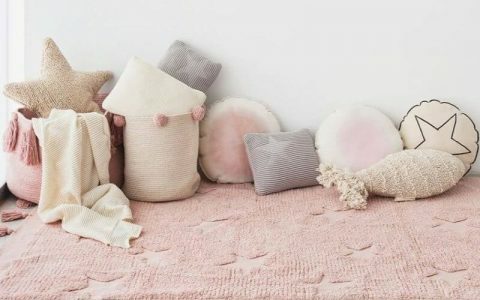 It’s not a traditional laundry basket, as it doesn’t have a lid, but that means that it’s super easy to pop dirty clothes into the basket… no excuses for things strewn all over the bathroom floor anymore! The handles and light weight mean it’s also really easy to carry it to the washing machine. 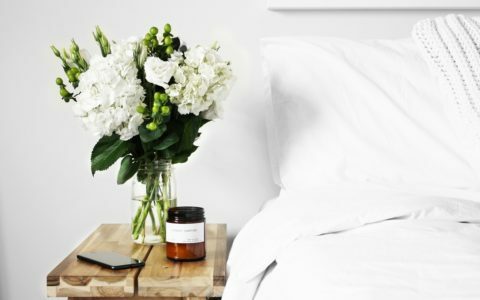 An added bonus to finish off the family bathroom were these beautiful fluffy white microfibre towels from The Bedroom Shop… they are super soft, super absorbant and really quick drying making them very economical!! The heated towel rail is from Jeeves. That concealed cistern makes it difficult to use grey water to flush. 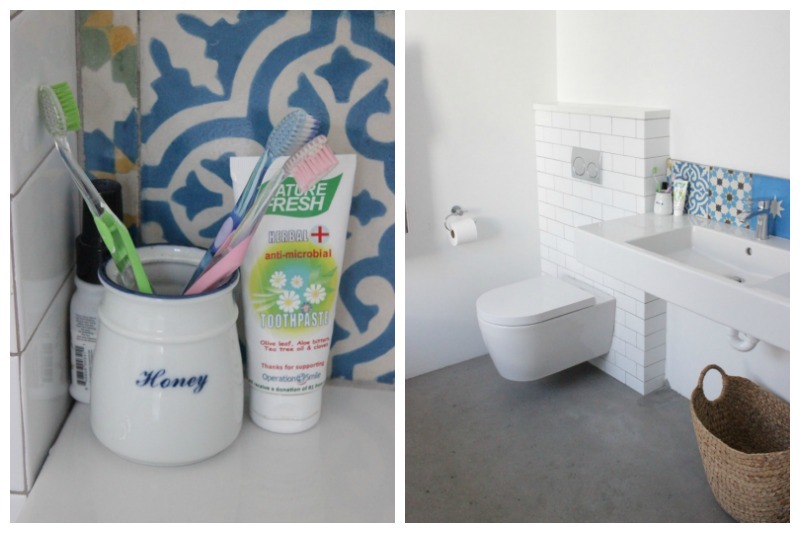 Cape Town’s drought restrictions are changing our bathroom habits.